Preheat oven to 350°F, and grease a 9-inch springform pan. Whisk graham cracker crumbs, butter, salt and 1/4 cup of the sugar together in a medium bowl until combined. Press firmly onto bottom of the pan (or up the sides, if desired). Bake for 10 minutes, then remove and let cool. Reduce oven heat to 325 degrees F.
Using an electric mixer, beat cream cheese on medium speed for 3 minutes until smooth. Add the remaining 1 cup sugar and beat for an additional minute until well blended. Add Greek yogurt and vanilla, and beat for an additional minute, stopping partway to scrape the bottom of the bowl with a spatula. Add eggs, one at a time, beating on low speed after each addition just until blended. Do not overbeat! Pour into crust. Close the oven door, and bake about 1 hour 30 min, or until center is almost set. (The cake should still jiggle ever so slightly.) Turn oven off, and open oven door slightly. Let cheesecake set in oven 1 hour. Then remove cheesecake from oven, carefully run a knife around the edges of the cake, and then let cool to room temperature. Refrigerate at least 4 hours or overnight. 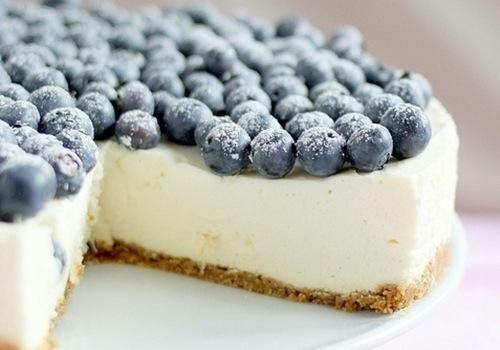 Remove springform rim, and top cheesecake with blueberry filling just before serving. Store leftover cheesecake in refrigerator in a covered container. Bring blueberries and 1/4 cup water to a boil in a medium saucepan, stirring occasionally. In a separate bowl, whisk together 1 Tbsp. water and cornstarch until combined. Stir mixture into the blueberries, and boil for an additional minute until thickened. Remove from heat and spoon over cheesecake just before serving.